A trio of lightweight lip powders that deliver high-impact color. The creamy powder transforms lips with a matte finish and intense metallic sheen. The weightless, velvety texture is designed for comfortable wear. Shades can be worn alone, mixed or layered for customizable looks. For added comfort prep lips with Base Balm. Two shade ways inspired by vivid, reflective Paris and bold, expressive New York. • Apply Base Balm to lips with finger tips or Lip Colour Brush. 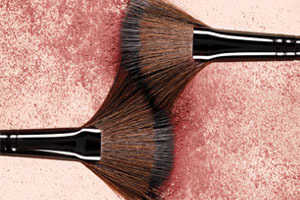 • Using a brush or fingers, apply Velour Lip Powder directly on top of Base Balm. Using a brush will create a more defined lip look. Using fingers will create a softer effect. • Use a pressing motion to easily pack pigment on lips. Continue adding layers for more intensity. • Use one shade alone or layer multiple shades to create more depth. • For more hydration, add Base Balm on top of the lips. LIP POWDER: MICA, DIISOSTEARYL MALATE, SOYBEAN GLYCERIDES, CAPRYLIC/CAPRIC TRIGLYCERIDE, ZINC STEARATE, BUTYROSPERMUM PARKII (SHEA) BUTTER UNSAPONIFIABLES, SILICA, LAUROYL LYSINE, ASCORBYL PALMITATE, CITRIC ACID, SODIUM DEHYDROACETATE, PHENOXYETHANOL, CAPRYLYL GLYCOL. MAY CONTAIN/ PEUT CONTENIR/(+/-): TITANIUM DIOXIDE (CI 77891), CARMINE (CI 75470), IRON OXIDES (CI 77491), IRON OXIDES (CI 77492), IRON OXIDES (CI 77499), MANGANESE VIOLET (CI 77742), RED 6 (CI 15850), RED 7 LAKE (CI 15850), RED 22 LAKE (CI 45380), RED 28 LAKE (CI 45410), RED 30 LAKE (CI 73360), YELLOW 5 LAKE (CI 19140). BASE BALM: HYDROGENATED POLYISOBUTENE, ISOSTEARYL ISOSTEARATE, PENTAERYTHRITYL TETRAISOSTEARATE, POLYBUTENE, POLYETHYLENE, PENTAERYTHRITYL HYDROGENATED ROSINATE, EUPHORBIA CERIFERA (CANDELILLA) WAX/ CIRE DE CANDELILLA/CANDELILLA CERA, CERA ALBA/BEESWAX/CIRE D’ABEILLE, SILICA. Experience the edgy glamour of New York. Apply Caviar Stick Eye Colour in Rush to the lid, blending from lash line to crease, and Ginger across the brow bone. Apply your favorite shades from the New York Velour Lip Powder Collection and layer onto the lips. For a bright matte lip, use Velour Extreme Matte Lipstick in Soirée or Metro. Experience the subtle seduction of Paris. Layer Caviar Stick Eye Colour in Cashmere across the lid and highlight with Beam. Apply your favorite shades from the Paris Velour Lip Powder Collection onto the lips for high-impact payoff. For a traditional intense matte lip, use Velour Extreme Matte Lipstick in Muse.